Do A Chrysler 300 Brampton Edition? After sales of the Chrysler 300 rose 250% in May 2012, 300 volume increased at a 19% clip in May 2013. That increase a year ago wasn’t good enough for the 300 to crack the list of Canada’s 20 best-selling cars. But the uptick in 300 sales last month most definitely was. 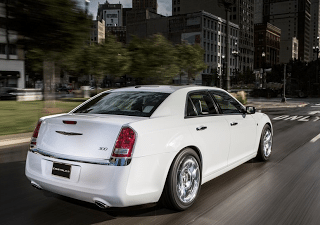 The Chrysler 300 was Canada’s 18th-best-selling passenger car in May 2013. Is there any car more American than the Chrysler 300? Sure there is. (The 300 and its siblings from Dodge are actually built in Brampton, Ontario.) Ford Mustang sales jumped 45% in May 2012. But that wasn’t enough for the Mustang to generate quite enough volume to crack the top 20. Mustang sales then rose 9% last month, and the 1246-unit result was enough for the Mustang to pip the 20th-ranked Dodge Avenger by two sales and the Volkswagen Golf by 13. The Ford Mustang was Canada’s 19th-best-selling car in May 2013. In all, seven Detroit brand cars found themselves on the list of Canada’s 20 most popular cars. That’s up from four in April and six a year ago, when the Ford Taurus and Ford Fiesta had joined the group. Historical monthly and yearly sales figures for any of these models can always be accessed through the dropdown menu at GCBC’s Sales Stats page, and for those not viewing the mobile version of this site, near the top right of this page, as well. GCBC has already published rankings for dozens of different brands and 13 different trucks and 20 SUVs and crossovers. This list is responsible for displaying the 20 best-selling cars in Canada from May 2013.